A Beijing-backed plan for a regional free-trade pact failed to advance on Thursday afternoon, with Asia-Pacific leaders simply repeating their support for a goal made at last year’s Apec summit. In a joint declaration to wrap up the two-day Asia-Pacific Economic Cooperation summit, the 21 leaders again backed a strategic study of the Free Trade Area of the Asia-Pacific (FTAAP), the goal they set in 2014 at their meeting in Beijing. They also said the US-led Trans-Pacific Partnership (TPP) – and the Regional Comprehensive Economic Partnership (RCEP) were “possible pathways” to realising the FTAAP. “We reiterate our belief that the FTAAP should be pursued as a comprehensive free-trade agreement by building on ongoing regional undertakings,” the leaders’ statement said. The declaration came a day after TPP signatories met in the Philippine capital on Apec’s sidelines. The statement also came after President Xi Jinping  warned that rival trade pacts in the Asia-Pacific region might cause “fragmentation” of the regional economy. Japanese Prime Minister Shinzo Abe told Apec leaders that he believed the trade pact would create a new economic order and could serve as a platform to determine rules for the FTAAP. He also said Tokyo would like to accelerate the negotiations for the RCEP, which includes China. The South China Sea disputes, which Washington had threatened to bring up during the economic summit, remained the elephant in the room. References to the territorial disputes were absent from the declaration but the issues were the major topic of almost all the bilateral meetings held by the Philippines, the United States and Japan. Former Taiwanese vice-president Vincent Siew Wan-chang, who represented the island at the summit, said none of the leaders raised the issue during the summit yesterday. “And no one raised the issue with me [during our chats ahead of the banquet last night],” he said. Siew said he had an extended conversation with Xi as the two walked to the banquet hall. He said he also witnessed a relaxed chat between Xi and US President Barack Obama. “While we were talking, Obama approached to say hi to both of us,” Siew said. “Xi asked Obama if he flew directly from Turkey to the Philippines after the G20 Summit … Then Obama asked Xi if he suffered any jet lag,” he said. Siew said Xi replied that he hadn’t this time but maybe he would suffer in Paris during the climate change summit. Xi’s presence in Manila was low-profile. He limited bilateral talks to meetings with the leaders of Malaysia, Colombia, and New Zealand. 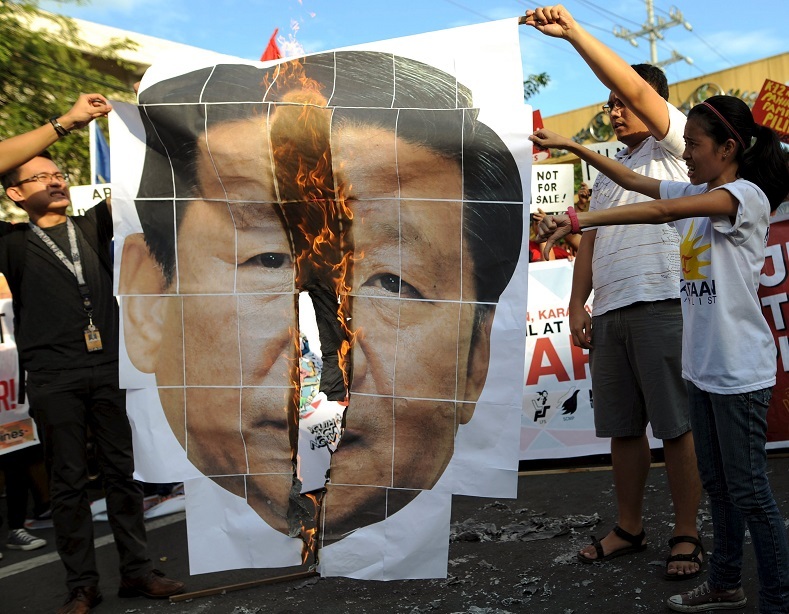 Hopes of meetings between Xi and Philippine President Benigno Aquino and Abe were not realised. After Xi left for Beijing yesterday, Abe and Aquino met and agreed in principle for Tokyo to supply defence equipment to Manila, a deal seen as helping to boost the Philippines’ presence in the South China Sea. “We share deep concern over unilateral action taken to change the status quo in the South China Sea such as land reclamation works,” Abe said after the meeting, without naming China. He also brought up Manila’s arbitration case in The Hague, saying Tokyo supports dispute resolution based on international law.